Ads and sponsorships are a great way to support the students’ opportunities and experiences throughout the year. Community partnerships and fundraising efforts are what makes these experiences possible. The Tarpon Springs Leadership and Music Conservatory is successful largely in part due to vast support from our community and corporate businesses. We appreciate the advertising and sponsorships of our community friends. Advertising is a cost-effective, tax-deductible, and a mutually beneficial way that you can help this nationally awarded music program while advertising your own business. We proudly encourage our band family and friends to support your business as you place your ad in our programs. All advertising and sponsorships may be paid online using the link at the bottom of the page. 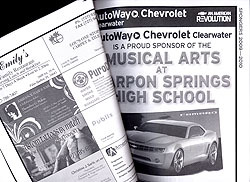 Donations to the Tarpon Springs High School Band Boosters, Inc. are tax-deductible as allowed by IRS rules. Golf Tournament Participate in our Golf Tournament by signing up for a foursome, donating a prize or becoming a sponsor to assist in the fundraising efforts for Tarpon Springs Leadership Conservatory. Amy Burns @ 901-581-3002 or email aburns@tarponspringsband.com. Donations to Tarpon Springs Band Boosters, Inc.